You may be spending a significant amount of Time and Energy to run your YouTube Channel. You might be putting a lot of Efforts for creating each and every Video in your Channel. You might have spent a lot of Money in buying Equipment and Software required for creating your Videos. Even you might be paying Money to the Freelancers who help you create your Videos in professional ways. You may be teaching your Skills or sharing your Business Success Secrets freely through your Videos. But, that doesn’t mean that your Channel will get Views. The increasing competition makes it very difficult to get Views even to the best Videos. So, it is very important to give attention to the Trending Topics. Let me explain about how the Trending Topics can bring more Visitors to your Video. First, I will tell about some SEO related Terms so that I can explain it using these Terms easily. Everyday, a lot of People are doing their search on Search Engines like Google and YouTube by typing or speaking Words that are called as Keywords. And, Search Volume is the word used to represent the amount or quantity of searches that occur for a particular keyword or term, often expressed as searches per month. Search Competition is how many Pages/Videos on the internet include that term, thus, the number of Pages/Videos you will be competing against. In normal days, the Search Volume and Search Competition will be almost constant for any Keyword. i-e They will be in a Balanced State. In this State, it is difficult for your Video to get lots of Views by competing with existing Videos. But sometimes, Search Volume will be increased suddenly due to some Events that may be either expected or unexpected. For example, a lot of people will be searching about a Person who is getting announced as a Nobel Prize Winner. That means, the Search Volume for the keywords related to that Person will be increased suddenly while the Search Competition is not getting changed much. You can make use of this opportunity of increased Search Volume to get traffic to your YouTube Channel by uploading Videos related to this Trending Topic. For making use of the expected Trending, like Sports Events, Political Meetings, Official Product Launch Events, Celebrity Birthdays and Festivals, you have to work in advance by preparing your Videos related to those Topics or Keywords. You need to keep a list of upcoming planned Events and Festivals, and check your list regularly to create Videos about the Topics or Keywords related to those Events. For making use of the unexpected Trending, like any unofficial Leak of any Product to be released soon, you should follow various News Agencies to get the News immediately, and you have to publish the Video immediately. You need to check Google Trends page and Twitter Trending List regularly, almost every Hour. Moreover, Google and YouTube will give high priority to the New Videos that are related to the Trending Topics. The New Videos will be shown at top of the Search Results even when there were lots of good old Videos available for that Trending Topic. i-e Your New Videos will be treated like a News Article from the well established News Websites. This is the Key for the success of creating Videos on Trending Topics. Let me explain the reason why Google and YouTube are behaving like this, by saying an example. Assume that there was a Heavy Rain in a particular Town. Someone living in another Town will hear about this news through other Media like Radio and TV. He will do the Search on the Google or YouTube by typing the name of the Town with the expectation of seeing more details about the Rain. Usually, many people will be doing search about any Town before visiting it. So, Obviously Google or YouTube should show the latest Articles or Videos related to the Heavy Rain than any other Good Old Articles or Videos, otherwise people may stop using Google or YouTube in the future. So, they have to behave in this manner. 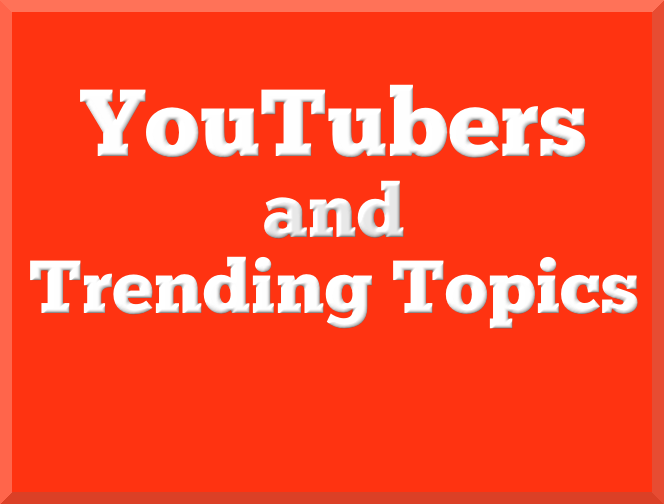 YouTubers can make use of this Trending Topics advantage, for getting more Views to their Videos. And make sure that you use it genuinely. Use it only for the Trending Topics that are related to your YouTube Channel and that are useful or interesting to your Target Audience. And, never try to include the Keywords of Trending Topics into the Title/Description/Tag of your Videos which are actually not related to the Trending Topic. I had published a Book with Title "How to Earn from YouTube Videos? : My Experience with YouTube " to share my experience about earning Money by running my YouTube Channel for many Years. If you are interested, you can buy it from Amazon. And, if you want me to spend significant time for reviewing your YouTube channel and Business Model, you can book my time and check my previous post to see the Price/Charge details.